I wish I can insert my actual feelings on this post. I know it's ridiculous to get overly excited over a sketchbook, but when you've been coveting something for literally a year and then to finally have it in your hands...oh my goodness. I can't. I first learned about Leuchtturm (Loysh-term) on Instagram from an artist I was following, I can't remember who. I loved that it came in a variety of colors, but of course knowing me I gravitated towards the neutrals. 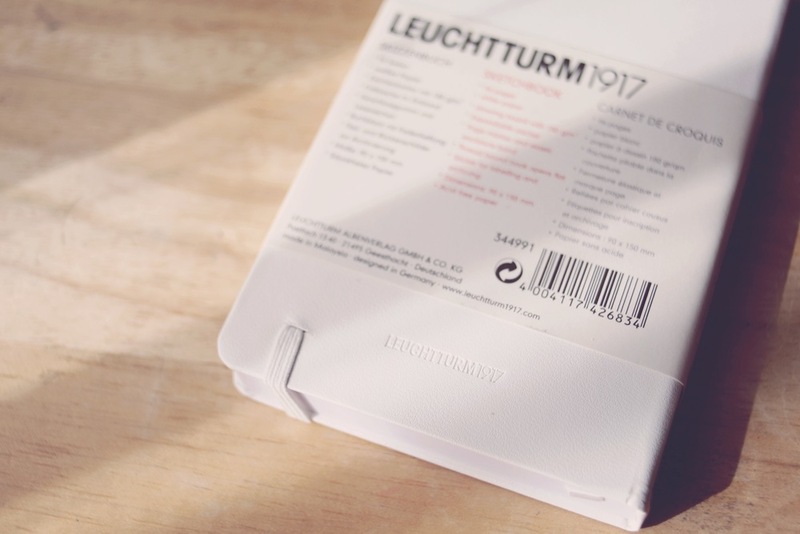 I researched about this brand for months and found that most preferred the Leuchtturm1917 more than Moleskine. The reason why it took me a year to finally get my hands on this German brand sketchbook is because it wasn't available in the U.S./online. I don't know how other people got one, maybe the brand sent them one or they bought it in Europe, but I had no luck. So for a few months, I decided to just stop searching...which helped because now they're available on Amazon. Woo! They seem to have some similarities which are the obvious: expandable pocket, page marker, elastic enclosure band, thread bound and acid free paper. But what really sets them apart is their paper. Moleskines paper has this ivory tone and is about 165 gsm, whereas Leuchtturm has white paper and is 180 gsm. If you've been a long time follower, than you may know that when it comes to paper, I LOVE white paper. Ever since I was a child, I would always draw on white printer paper and sketchbooks with white paper. Which explains why I'm so picky with sketchbooks. I've had many Moleskine notebooks and sketchbooks in the past, and I tried my hardest to like their paper (mainly because everyone used Moleskine), but I realized that I shouldn't force myself to like something. If I don't like it, I just don't like it. Now, looking at Leuchtturm's beautiful white paper, I can already picture all the great things I can do with this sketchbook! And the fact that it's much thicker than Moleskine's paper, I know it can hold watercolor and ink well. I did a quick test page and so far so good :) I can't say anything about markers, but I'm sure it holds well since most artists I've seen have used copics on their sketchbooks. You'll most likely be seeing this sketchbook a lot on my Instagram! I plan to use this for everyday. I already filled up my Muji notebook a couple months ago (which I will eventually have a flip through video of), so it was definitely time for a new pocket sketchbook to bring with me on my adventures!